Two years before he died, St. Thomas Aquinas probably the greatest teacher the Church has ever known was asked by his assistant, Brother Reginald, to write a simple summary of the Faith of the Catholic Church for those who lacked the time or the stamina to tackle his massive Summa Theologica. In response, the great saint quickly set down in language that non-scholars can understand his peerless insights into the major topics of theology: the Trinity, Divine Providence, the Incarnation of Christ, the Last Judgment, and much more. Here, then, is not only St. Thomas's concise statement of the key elements of his thought, but a handy reference source for the essential truths of the Catholic Faith. Much more that will help you know and love God with greater understanding! "A gem, a precious pearl, a masterpiece!" "An invaluable introduction to all of St. Thomas's wisdom and insight." "Thomas Aquinas at his clearest and best. A treasure." 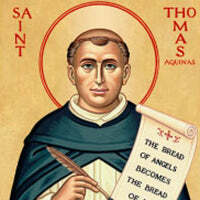 Saint Thomas Aquinas (1225 - 7 March 1274) is a Doctor of the Church. He was an Italian Dominican friar Roman Catholic priest, who was an immensely influential philosopher, theologian and jurist in the tradition of scholasticism, within which he is also known as the "Doctor Angelicus" and "Doctor Communis".